So, we’ve updated our web shop, and have had it up and running for a week or so – to check it’s all working properly – and everything’s good! So, if you need any JJ shirts, or CD’s – go and check it out. We’ve also added a few extra new designs of shirts, there’s an “Info Freako” tee, featuring the iconic sleeve design. This was the first tee we ever had, back in 1989, and it’s back, ready for it’s thirtieth year. 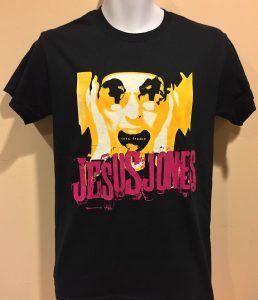 We also have new Jones logo shirts, in black or white. The shop is also stocked up with the last remaining copies we have of the deluxe reissues of the first four albums. These packages have the original album – remastered – plus all of the relevant b-sides and remixes. Plus, each package has an in-depth selection of demos, rarities, and previously unheard material. There’s a DVD too, which has unseen live footage, alongside promo videos and more. These reissues are the definitive way to get the first four albums – and once these copies are gone, we can’t get any more. Plus, we’ll be getting CD copies of “Voyages”, the companion piece to “Passages” soon, as well. And, as if that wasn’t enough, we’re also reacting to requests you’ve sent us, and will be looking to make some JJ hoodies too. We’ll have these in the shop soon – and when we get mock ups of the designs, we’ll share those here.